1.3.3. Initialization - init.el file. 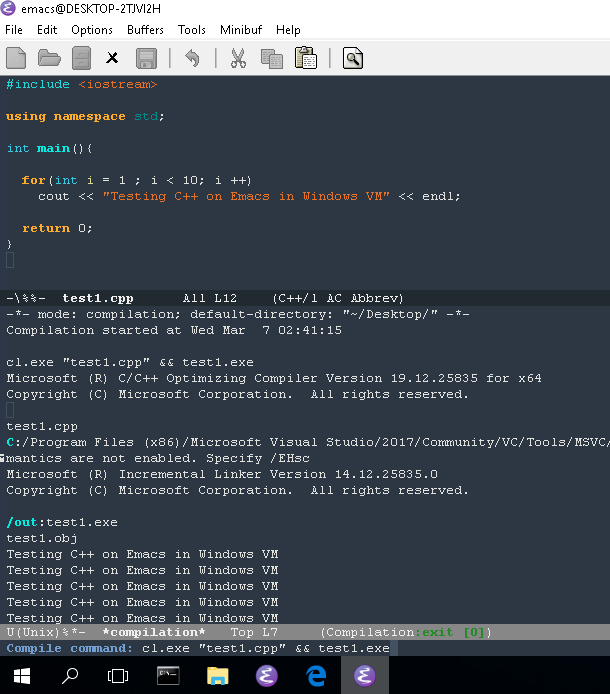 Why Emacs on Windows ? Powerful terminal emulator: Emacs can be a powerful terminal emulator for Windows and a outstanding replacement for cmd.exe terminal emulator because it has history, multi line history and multi line input and tiling windows where it is possible to split the Emacs window and run a repl and edit a file on the same window. Unlike cmd.exe Emacs can also run multiple REPLs in the same window. Run any shell: Emacs can run any shell application like Python, IPython, Powershell, cmd.exe, bash, C# shell, F# and so on. Eshell: Eshell is unix-like shell implemented in Elisp providing many unix commands like ls, mv, cp, rm without any external dependencies and it is also highly integrated to Emacs allowing the user to call elisp functions, browser directories, open files (visit buffer). Dired mode: Dired mode allows fast directory navigation and to run commands or apply shell commands on files like md5sum, rm -rf, git add and so on. Emacs 64 bits - 64-Bit GNU Emacs for MS Windows with optimization. Git for Windows provides many Unix utilities ported for Windows like awk, cat, ls, chown, grep, find and etc. The HOME environment variable that has the default value /home/<username>) on Linux sets the user's directory path. This variable, which is equivalent to _%USERPROFILE% _(C:\\Users\<username> ) is expected to be set by many Unix applications ported to Windows and it also makes directory browser in Emacs and shells easier. It can be set permanently by using the commmand below on cmd.exe shell. Executables located in directories listed in PATH environment variable can be invoked without its full path like ls, echo and who in Unix-like OS or ipconfig, arp and whoami in Windows. It makes easeir to call C:\Users\<user>\bin\curl.exe from any directory. Instead of write its full path the user can just run $ curl.exe or $ curl. The Ctrl (Control) key is one of the most used keys, although it is one of the most inconvenient and ergonomically bad key to type possible leading to strain injury when used often as in Emacs. On the other hand, Capslock while in a convenient position is one of the most useless keys as it is not used often and upper case letters can be typed just by holding the shift key while typing the underlying letter. Those problems can be overcome by mapping the Capslock key to Ctrl and Ctrl to Capslock. On Windows it can be done by running the commands below in the powershell as administrator and then rebooting or by entering in the cmd.exe shell and typing $ powershell and then pasting the mentioned commands. 1.3.3 Initialization - init.el file. This section provides a minimal configuration for Windows to deal with pitfalls and annoyances. Do not open file or user dialog. Use Unix's \n (LF- Line Feed) and utf instead of Windows \r\n (CRLF - Carriage Return and Line Feed) as end of line character. It may not be desirable if most files or project edited are for Windows or building tools that may fail if the source file doens't CRLF as line ending. Handy key bindings for invoking compilation command. Type Ctrl + F9 to call M-x recompile - running the compilation command again. You can bash install with Chocolately package manager or download GIT version control app that comes bundled with bash and Unix utilities like grep, mv, ssh, df and dd. Integration with Eamcs since it can run Emacs commands (interactive functions) like shell commands. Eshell can run Emacs elisp commands (interactive functions) like find-file, dired as ordinary shell commands like is shown above. The function find-file can be executed in eshell as shell command find-file ~/.emacs.d/init.el . Eshell comes with a pseudo clipboard device /dev/kill that is useful to handle clipboard. Note: split-string Is an Emacs function. ~/Desktop $ split-string $PATH ";"
Calling the default and official Windows' C++ compiler MSVC (Microsoft Visual C++) from command line is not easy as calling gcc, mingw or clang as MSVC needs environment variables INCLUDE, LIB, LIBPATH and PATH to be properly set with correct paths. Those settings depends on the version of the compiler and the building target x86 (32 bits) or x64 (64 bits), so the path settings of MSVC 2015 are different from MSVC 2017. This section provides useful commands that solve this problem by allowing the user call the compiler directly which may be useful for studying c++ on Windows, learning about Windows API, testing the compiler, building simple C++ programs or creating proof-of-concepts. Note: It was tested with MSVC 2017 and Windows10. To use it just copy the functions to the file ~/.init.el or emacs intialization file. This command sets environments variables for MSVC - 2017 Building tools and x68 building target. If the user runs M-x msbuild-2017-x86-setup, it will allows to call the msvc compiler cl.exe with M-x compile cl.exe file.cpp. Then, the code will be compiled for x86 target. It is also possible to call with M-x compile the commands msbuild.exe, link.exe (MSVC's linker) and dumpbin.exe (similar to GNU objdump). "Set enviorment variables to load Microsoft Visual C++ Compiler (MSVC 32 bits)"
"C:/Program Files (x86)/Microsoft Visual Studio/2017/Community/VC/Tools/MSVC/14.12.25827/ATLMFC/include"
";" "C:/Program Files (x86)/Microsoft Visual Studio/2017/Community/VC/Tools/MSVC/14.12.25827/include"
";" "C:/Program Files (x86)/Windows Kits/NETFXSDK/4.6.1/include/um"
";" "C:/Program Files (x86)/Windows Kits/10/include/10.0.16299.0/ucrt"
";" "C:/Program Files (x86)/Windows Kits/10/include/10.0.16299.0/shared"
";" "C:/Program Files (x86)/Windows Kits/10/include/10.0.16299.0/um"
";" "C:/Program Files (x86)/Windows Kits/10/include/10.0.16299.0/winrt"
"C:/Program Files (x86)/Microsoft Visual Studio/2017/Community/VC/Tools/MSVC/14.12.25827/ATLMFC/lib/x86"
";" "C:/Program Files (x86)/Microsoft Visual Studio/2017/Community/VC/Tools/MSVC/14.12.25827/lib/x86"
";" "C:/Program Files (x86)/Windows Kits/NETFXSDK/4.6.1/lib/um/x86"
";" "C:/Program Files (x86)/Windows Kits/10/lib/10.0.16299.0/ucrt/x86"
";" "C:/Program Files (x86)/Windows Kits/10/lib/10.0.16299.0/um/x86"
";" "C:/Program Files (x86)/Microsoft Visual Studio/2017/Community/VC/Tools/MSVC/14.12.25827/lib/x86/store/references"
";" "C:/Program Files (x86)/Windows Kits/10/UnionMetadata/10.0.16299.0"
";" "C:/Program Files (x86)/Windows Kits/10/References/10.0.16299.0"
";" "C:/Program Files (x86)/Microsoft Visual Studio/2017/Community/VC/Tools/MSVC/14.12.25827/bin/HostX86/x86"
";" "C:/Program Files (x86)/Microsoft Visual Studio/2017/Community/Common7/IDE/VC/VCPackages"
";" "C:/Program Files (x86)/Microsoft Visual Studio/2017/Community/Common7/IDE/CommonExtensions/Microsoft/TestWindow"
";" "C:/Program Files (x86)/Microsoft Visual Studio/2017/Community/Common7/IDE/CommonExtensions/Microsoft/TeamFoundation/Team Explorer"
";" "C:/Program Files (x86)/Microsoft Visual Studio/2017/Community/MSBuild/15.0/bin/Roslyn"
";" "C:/Program Files (x86)/Microsoft Visual Studio/2017/Community/Team Tools/Performance Tools"
";" "C:/Program Files (x86)/Microsoft Visual Studio/Shared/Common/VSPerfCollectionTools/"
";" "C:/Program Files (x86)/Microsoft SDKs/Windows/v10.0A/bin/NETFX 4.6.1 Tools/"
";" "C:/Program Files (x86)/Microsoft SDKs/F#/4.1/Framework/v4.0/"
";" "C:/Program Files (x86)/Windows Kits/10/bin/x86"
";" "C:/Program Files (x86)/Windows Kits/10/bin/10.0.16299.0/x86"
";" "C:/Program Files (x86)/Microsoft Visual Studio/2017/Community//MSBuild/15.0/bin"
";" "C:/Program Files (x86)/Microsoft Visual Studio/2017/Community/Common7/IDE/"
";" "C:/Program Files (x86)/Microsoft Visual Studio/2017/Community/Common7/Tools/"
The command below sets enviroment variable for MSVC - 2017 and x64 building target and its similar to msbuild-2017-x86-setup. "Set enviorment variables to load Microsoft Visual C++ Compiler (MSVC) 64 bits"
"C:/Program Files (x86)/Microsoft Visual Studio/2017/Community/VC/Tools/MSVC/14.12.25827/ATLMFC/lib/x64"
";" "C:/Program Files (x86)/Microsoft Visual Studio/2017/Community/VC/Tools/MSVC/14.12.25827/lib/x64"
";" "C:/Program Files (x86)/Windows Kits/NETFXSDK/4.6.1/lib/um/x64"
";" "C:/Program Files (x86)/Windows Kits/10/lib/10.0.16299.0/ucrt/x64"
";" "C:/Program Files (x86)/Windows Kits/10/lib/10.0.16299.0/um/x64"
";" "C:/Program Files (x86)/Microsoft Visual Studio/2017/Community/VC/Tools/MSVC/14.12.25827/lib/x64/store/references"
";" "C:/Program Files (x86)/Microsoft Visual Studio/2017/Community/VC/Tools/MSVC/14.12.25827/bin/HostX86/x64"
";" "C:/Program Files (x86)/Windows Kits/10/bin/x64"
";" "C:/Program Files (x86)/Windows Kits/10/bin/10.0.16299.0/x64"
This command allows to compile the current buffer. For instance, if the current buffer is associated to a file test1.cpp and user types M-x compile-msvc-x86, it will show a prompt with cl.exe test1.cpp asking the user to confirm or complement the compilation command. (let ((compile-command (format "cl.exe \"%s\""
M-x msbuild-2015-x86-setup and Set environment variables to allow calling cl.exe for x86 build target and other tools from M-x compile and shell commands. "Set enviorment variables to load Microsoft Visual C++ Compiler 2015 (MSVC) 32 bits"
"C:/Program Files (x86)/Microsoft Visual Studio 14.0/VC/INCLUDE"
"C:/Program Files (x86)/Microsoft Visual Studio 14.0/VC/LIB"
";" "C:/Program Files (x86)/Microsoft Visual Studio 14.0/VC/LIB"
";" "C:/Program Files (x86)/Windows Kits/10/UnionMetadata"
";" "C:/Program Files (x86)/Windows Kits/10/References"
";" "C:/Program Files (x86)/Windows Kits/10/References/Windows.Foundation.UniversalApiContract/1.0.0.0"
";" "C:/Program Files (x86)/Windows Kits/10/References/Windows.Foundation.FoundationContract/1.0.0.0"
";" "C:/Program Files (x86)/Microsoft Visual Studio 14.0/VC/BIN"
M-x msbuild-215-x64-setup - Similar to previous command. "Set enviorment variables to load Microsoft Visual C++ Compiler 2015 (MSVC) 64 bits"
"C:/Program Files (x86)/Microsoft Visual Studio 14.0/VC/LIB/amd64"
";" "C:/Program Files (x86)/Microsoft Visual Studio 14.0/VC/BIN/amd64"
";" "C:/Program Files (x86)/Microsoft SDKs/Windows/v10.0A/bin/NETFX 4.6.1 Tools/x64/"
Commands to compile file related to current c++ buffer. The esiest and fastest way to install MSVC building tools is by using the chocolately package manager which provides a Linux-like experience for installing packages. Batch files (*.bat extensions) can be used as *nix Makefiles to perform build-automation on Windows, compile C++, C, and C# programs and also perform a wide variety of tasks. Example: This file build.bat compiles and run the file test1.cpp with Visual C++ compiler. To build the C++ file codes/test.cpp, it just to put this file to the directory to the directory where is test.cpp and then type in Emacs M-x build or M-x build.bat. The build script can also be executed using the Windows shell cmd.exe, by entering $ cd <project> and then typing build or build.bat. It can also be run by double clicking at the file build.bat. set VS2017="C:\Program Files (x86)\Microsoft Visual Studio\2017\Community\VC\Auxiliary\Build\vcvarsamd64_x86.bat"
set VS2015="C:\Program Files (x86)\Microsoft Visual C++ Build Tools\vcbuildtools.bat"
$ msbuild WpfAppLearning.sln /p:Configuration=Release /p:Platform="Any CPU"
To build a Visual studio solution (aka project). Rebuild applicatio with Visual Studio Command line switch. Compile a Scala application and run it. It is also worth knowing some DOS / Windows command line tools for compiling applications on Windows. Show Command Help bash –help set /?, cl.exe /? ..
Go to Disk or Mount Point $ cd /mnt/mount-point $ C:, $ D:, $ E: ..